The most versatile & sensitive static headspace system available. 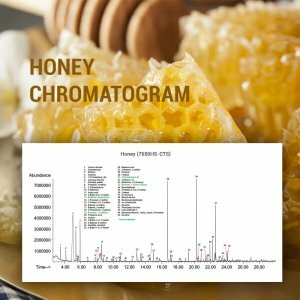 The all-new 7650HS-CTS is the only commercially available solution that can quantify the consumer experience by taking an equilibrium “snapshot” of the headspace to accurately determine its composition from the lightest through the heaviest compounds. The 7650HS-CTS is truly unique as it is the industries “only” system that uses multiple stages of true capillary columns to perform headspace preconcentration. This patent pending technology is creating a SPME like sampling, but in a way that obtains complete recovery of the lightest to the heaviest headspace compounds with virtually no reactive losses and no carryover. When sampling a large volume at static equilibrium, all compounds are quantitatively recovered at the same concentration as experienced by the consumer, giving the flavor or fragrance Chemist remarkable insight into exactly what the consumer is smelling, at exactly the same relative concentrations. 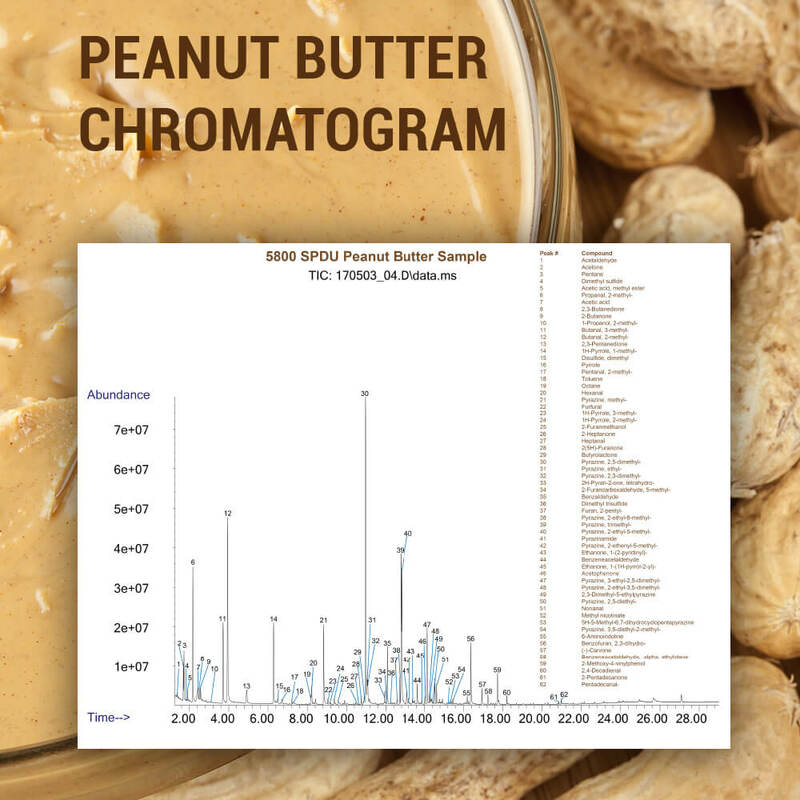 This avoids the reactivity and carryover associated with other thermal desorption systems on the market that still use packed traps to concentrate the sample. 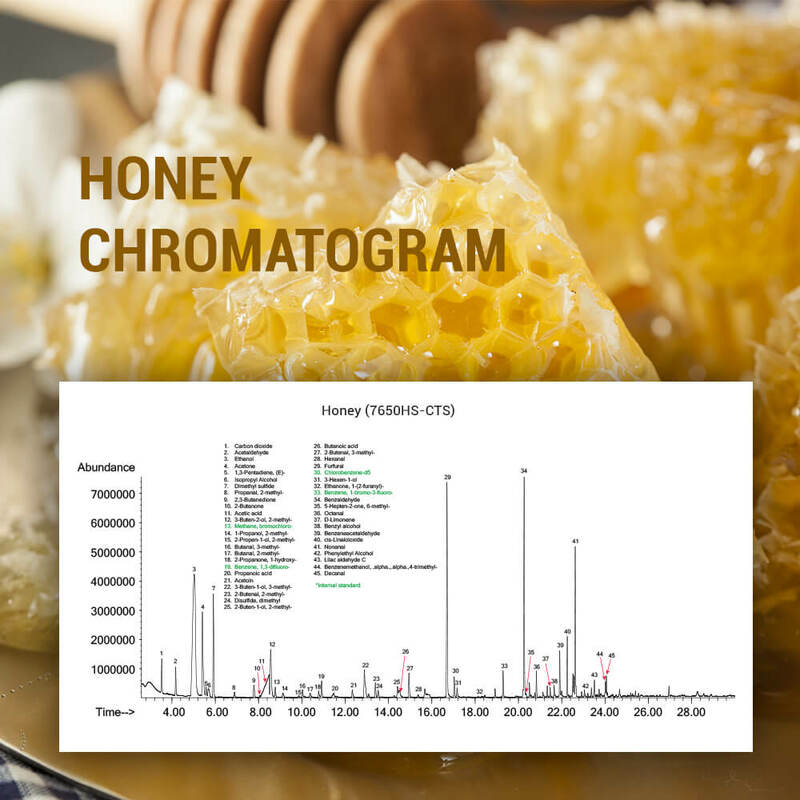 The 7650HS-CTS supports sample analysis via large and small volume static headspace (1–1000cc) to accommodate a wide range of concentrations with quantitative recovery of compounds with boiling points from -50°C to >400°C. The 7650HS-CTS maximizes throughput while offering state-of-the-art performance in quantitative accuracy, sensitivity, and low carryover. 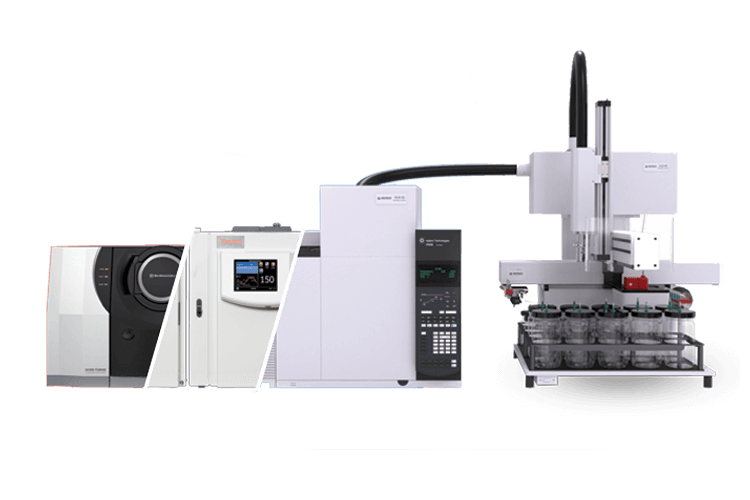 The 7650HS-CTS resides to the right of the GCMS system, with multiple trays supporting several different sample container sizes. The 7650HS-CTS is compatible with the latest 1D/2D chromatographic solutions for food, flavor, aroma, product testing, environmental, and clinical applications. 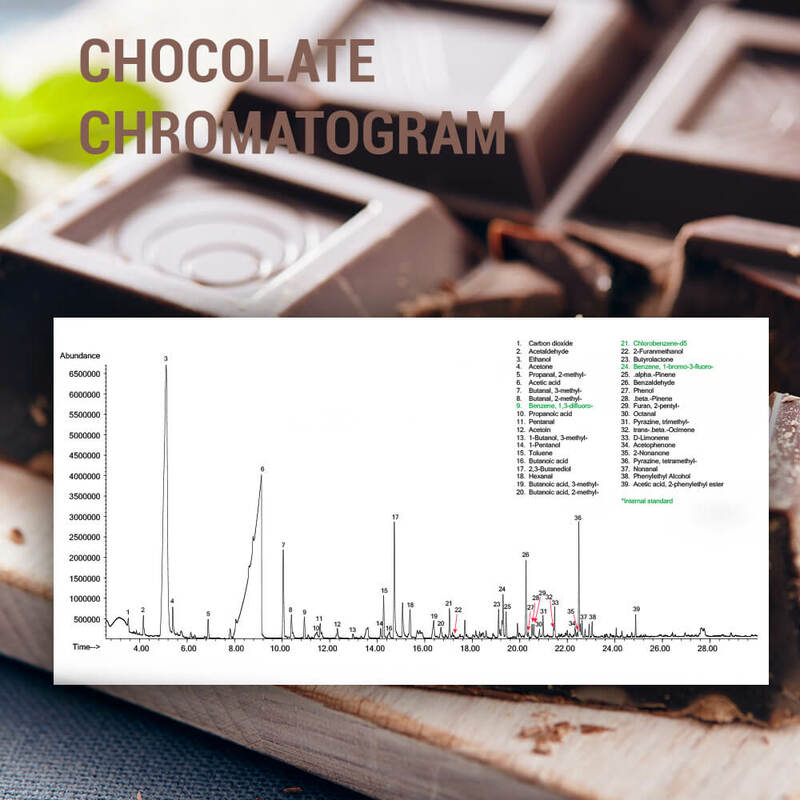 Generate beautiful Chromatograms! Sharper peaks than even before. Classical SPME (Solid Phase Microextraction) uses passive diffusion to collect and partition headspace compounds onto a coated fiber/lament placed directly in the sample headspace. The time required for each analyte to come to equilibrium with a SPME fiber depends on individual vapor pressures and coating affinities. Lighter, more volatile compounds have much less phase affinity than heavier compounds. As a result, true headspace concentrations fail to be accurately analyzed and reported whenever the SPME fiber headspace exposures exceed the equilibration time of the most volatile analytes – which may occur in just a few seconds! Unfortunately, it can take 10–90 minutes to collect enough of the heavier aroma compounds to allow detection by GCMS. This results in the heavier compounds being over-represented relative to lighter compounds by several hundred fold. This fact alone makes passive SPME a qualitative, rather than a quantitative technique for the determination of headspace composition. 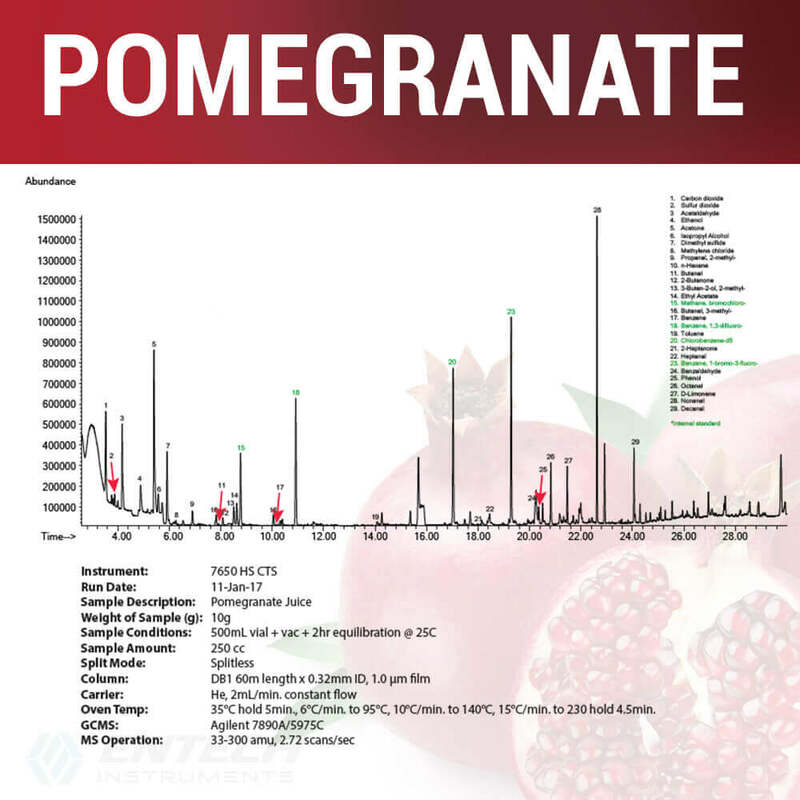 In addition, the extent of partitioning into a SPME fiber for any particular analyte is dependent on temperature and sample matrix variations. Upon desorption, the SPME lament is placed directly into a hot injector – which may thermally alter the sample composition. 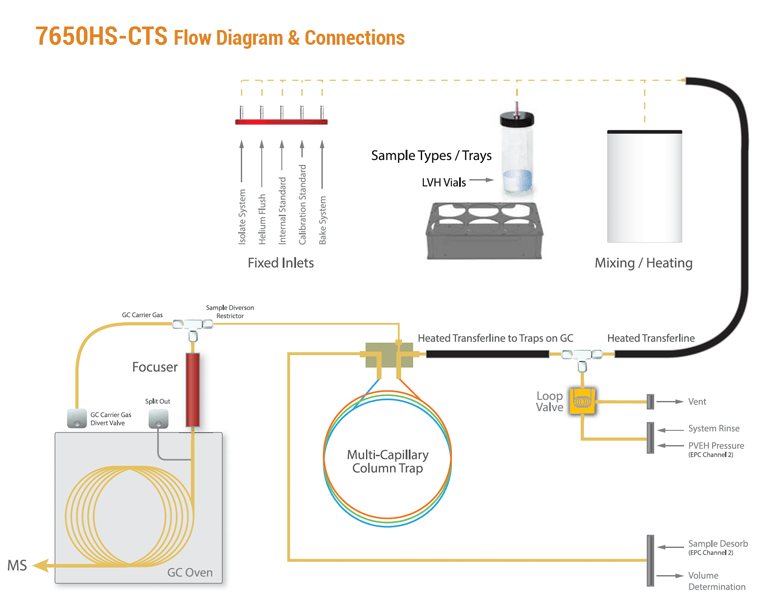 Capillary Column Trapping with the 7650HS-CTS utilizes multiple capillary columns with increasing strength to recover all relevant compounds, allowing a known volume to be sampled for quantitative determination of headspace composition. Water and air pass through the traps almost unretained, eliminating the interferences associated with improper management of the matrix. 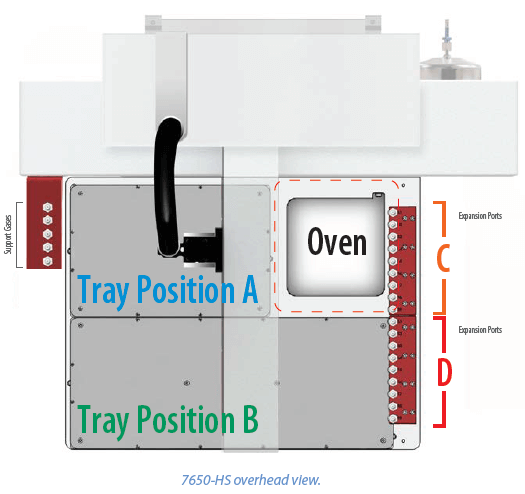 The 7650HS-CTS performs Large Volume Static Headspace under equilibrium conditions. Samples are allowed to come to equilibrium over 30-60 minutes, with optional warming in a mixing oven prior to extracting the headspace into the capillary traps. 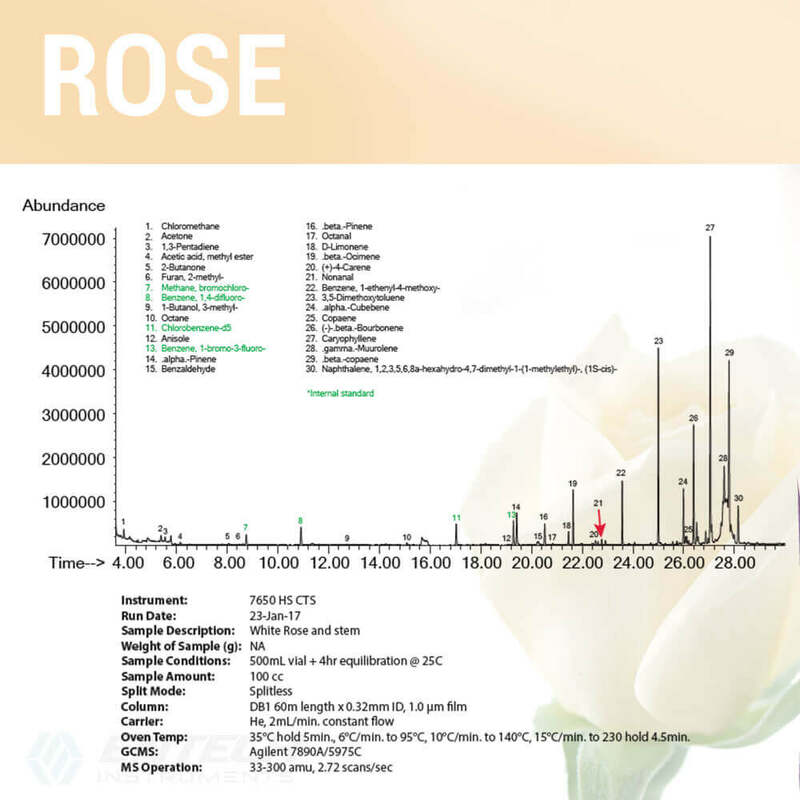 Aroma Significant Compounds (ASC), are easily identified with a small volume injection (10cc) using GC/Olfactometry. 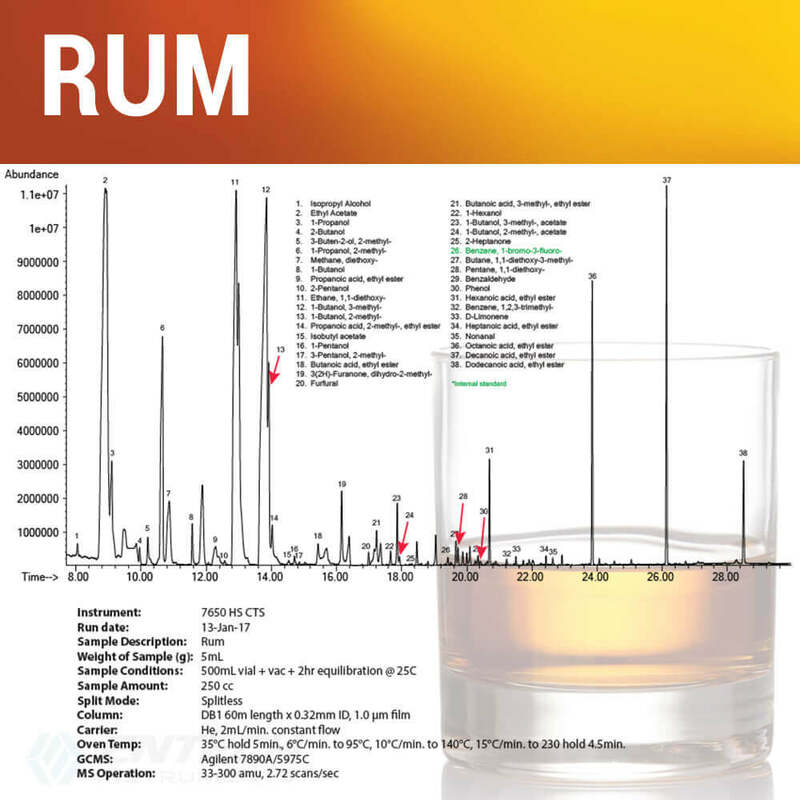 The mass spectrum of detected aromas can then be obtained by analyzing a larger volume of headspace (50–1000cc). 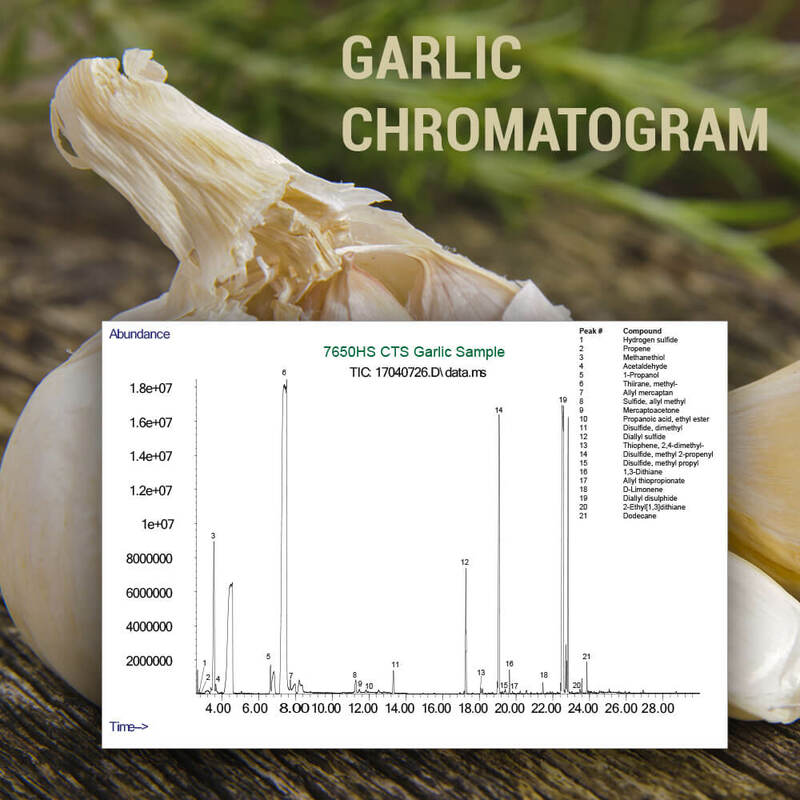 Only those aromas detected within the small volume GC/O analysis need be identified, significantly reducing aroma characterization complexity. 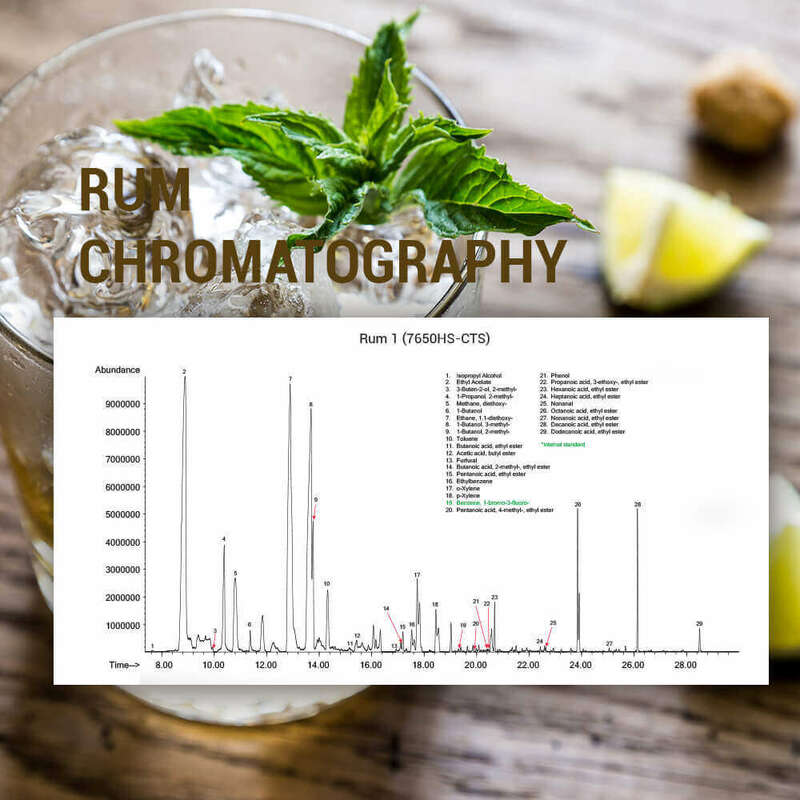 High ethanol concentrations are managed either by flushing additional gas through the column traps in the forward flow direction, or by using a solvent delay in the mass spectrometer to let the ethanol clear the GC column prior to commencing with data collection. Capillary columns perform the sample enrichment, improving quantitative accuracy. Gas-tight seal down to full vacuum. 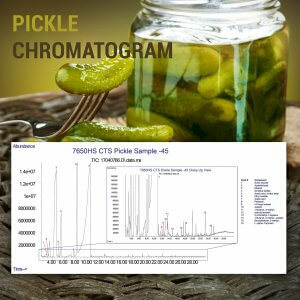 Analyze compounds containing sulfur, phosphorous, nitrogen. (Air, nitrogen, CO2 , H2 , He, methane, mixture). Improves separation and the resolution of compounds boiling below 50°C. Rapid heating and sample equilibration. Capillary column traps have virtually zero water retention. The 7650HS-CTS | One Instrument. Endless Possibilities. Headspace extraction is performed using Entech’s unique septumless micro-seal for repeated gas-tight sample access. This approach completely avoids the use of septa, preventing coring and compound absorption found with these simple rubber seals. The micro-seal allows samples to be stored under vacuum for enhanced equilibration rates. The most advanced and quantitative high sensitivity static headspace solution available. It traps all compounds boiling from -50°C to >400°C, except for water vapor which is almost unretained. 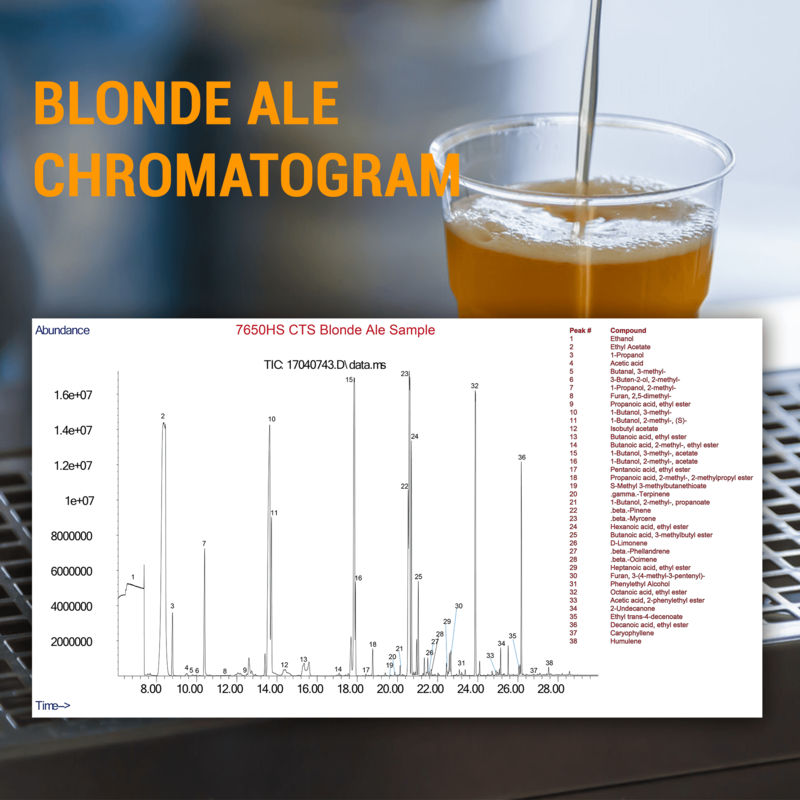 Thermally labile, GC compatible compounds are virtually all recovered, because the headspace goes directly to capillary column traps, followed by backflushing right onto the GC analytical column. 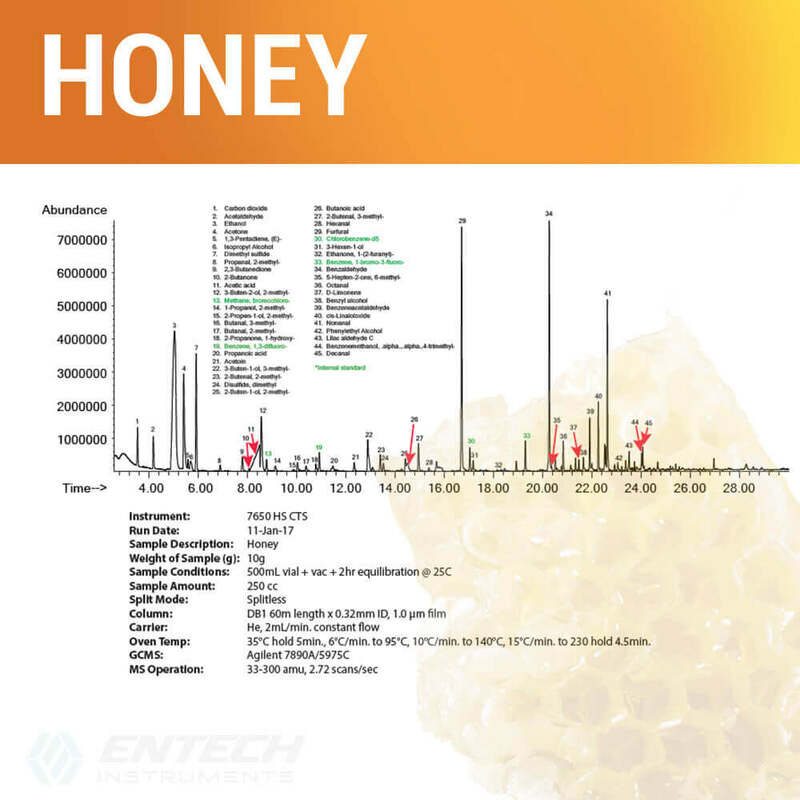 See the Entech Catalogue for the full parts list. 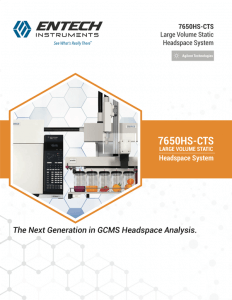 The 7650-HS uses Entech’s exclusive Multi-Capillary column trapping system (MCCTS) that provides better “true” characterization of trace headspace concentrations than any other headspace technique. A 3-stage trapping system features an initial thick-film GC column that performs On-Column Extraction to “absorb” semi-volatile compounds, allowing them to be simply “reverse flushed” off the thick-film column and onto the analytical column in the GC for better recovery of both high boilers and thermally labile compounds. Get Product Pricing, Promotions, App Notes & More!